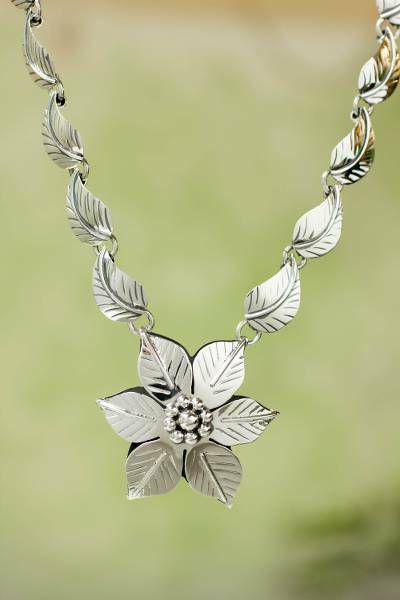 Sterling Silver Necklace from Taxco Jewelry Collection, "Floral Renaissance"
Suspended at the center of a leafy vine, a flower casts a spell of naturalistic elegance. The beautifully detailed necklace by Taxco's Joaquin and Josefina is crafted by hand of sterling silver. I was drawn to the realistic look of this necklace, and now that I own it, it is even more beautiful in person. I wondered if the flower at the center of the piece might be overpowering, but its size is just right. The necklace is the perfect length, and the leaves lie flat down my neck. Thank you for making such a beautiful piece of jewelry. hello: I ordered the glorious sun cuff bracelet. I really loved it, but it was small for my wrist. Wish you could make it in 2 5/8 inch size too. I have a big wrist and I apologize I had to return it back. sorry. Hope you make the big one too.